This morning my coworker Sarah Calhoun and I presented again at the Oberlin Digital Scholarship conference, “Building a Distributed Collaborative Model for Digital Scholarship Support at Liberal Arts Institutions: A Mixed Metaphor Salad.” Our other co-presenter, Austin Mason, couldn’t make it to the session, but he gets the credit for finding and bringing to us the metaphor that drove the session. He’d attended a session by Liz Milewicz of Duke University and gotten permission to reuse her metaphor. And the metaphor in question? Various methods of crossing water from one shore to another. Here’s how we used it. On occasion, supporting the digital humanities can feel an awful lot like trying to drive a car across a rope bridge. Either the infrastructure is inadequate for the project, or the project chose the wrong infrastructure to use to get across the river. In an attempt to avoid this unfortunately pairing of project and infrastructure as much as possible, we propose thinking carefully about the infrastructure we put into place, and also about how to communicate clearly with researchers and with ourselves. We want researchers to find and use the right resources for the job, and we want to prevent siloed services that may duplicate effort or cause turf wars. And one way to think through these issues is to map out what’s happening on your campus. Most campuses will have brave DIY-ers, who cross the river in daring ways using found objects (fallen logs) or special skill/access (base jumpers). These are important parts of creative research on our campuses, but they are not very repeatable or scaleable. They are not a great plan for a support model. One of the low-barrier, low-overhead, repeatable methods of crossing might be a rope ferry. These work quite well either solo or with a ferryman, but they may not be terribly stable over time. Perhaps various semi-ephemeral things like free blogs or social media fit here, where researchers can get information up online, but it may not be stable over time if the researcher or the service move in new directions. Or perhaps there are more modern ferries available. These are larger, more powerful, and require less effort on the part of the researcher. Maybe something like an institutional subscription to Omeka or WordPress fit here. They were for a lot of people interested in doing a lot of different kinds of things, and support can be pretty standard on campus. But if you have a ferry running the same route over and over and over, and if you also have some money and staff for new construction, maybe it’s time to build a bridge. 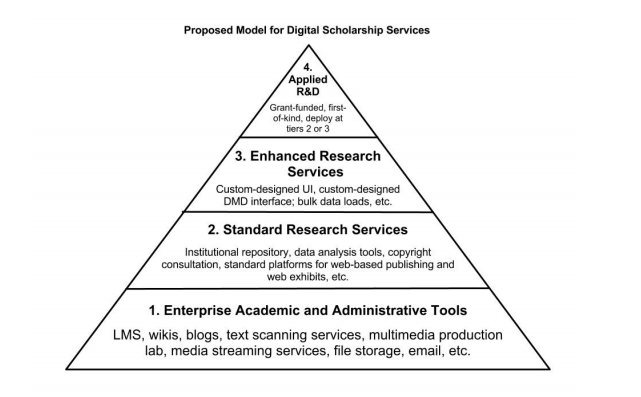 Some schools, for example, have a whole unit or a Center dedicated to supporting digital humanities. Some of these Centers are even iconic, like the Brooklyn Bridge. And I think that depending on the school, a massive, multi-lane bridge with tons of on-ramps and off-ramps might be a wonderful thing. However, bridges really do require upkeep, they can become bottlenecks, they often have height and weight restrictions, and they may not serve all needs. Researchers are creative beings who may need to start in a different spot, end in a different spot, or get across in unusual ways. So at this point it becomes a matter of project portfolio management. Library Administration 53, no.1 (January 1, 2013): 27-42. doi:10.1080/01930826.2013.756689. Jennifer Vinopal (who was also this conference’s keynote speaker, though we’d planned to site her even before we knew that), and her colleague Monica McCormick wrote a fantastic piece on “Supporting Digital Scholarship in Research Libraries: Scalability and Sustainability” in the Journal of Library Administration. In it they recommend having an infrastructure such that the majority of project can use standardized tools that are well-supported on campus. Then allow for creativity by building in support for projects that can mostly use those standard tools but with some standardized consultation services, or with a bit of custom tweaking. But reserve some capacity for a few truly custom projects that will require a lot of support (and try to make sure that these project can be “first of a kind” rather than truly one-off projects). So perhaps you have a couple of docks for some ferries not far from your bridge, or a landing area for your base jumpers, but there’s communication and vetting involved in committing resources to these special projects. And no matter your solution, close communication between support and coordination folks will prevent boating collisions, or the building of duplicate bridges. To mix metaphors quite wildly, at Carleton we think of our coordinating folks as a three-legged stool: Library, Humanities Center, and Academic Technology. Representatives from these areas try to make sure that things move forward in a coordinated fashion even when the actual support and work of digital scholarship happens in all kinds of places on campus. We’re calling it a “coordinated distributed model,” and it is still in its infancy. We are currently tackling the question of what infrastructure to build and for whom, which tools will be our standard and which will we cut loose, who will be involved and to what extent, and how will we make sure that people who need us will find us? Exploring these questions, we handed out blank maps to participants and asked them to depict their campus’ current models, talking in small groups about how things work on their campuses, and comparing with others to find trends and themes. One fascinating thing was that there were three participants from one college, and all three drew different maps. Others drew people drowning in the river, or people standing on one shore and gazing longingly at the distant shore. But one thing that became clear was that whatever infrastructure an institution adopts, it has to fit the local context. There’s no sense sinking a ton of money in a massive bridge if there’s no demand, or just because another school did it. And on the other hand there’s no sense leaving researchers to fend for themselves on campuses where lots of people have a similar need. Then we handed out new blank maps and asked participants to think about an ideal infrastructure for their campuses over the next 5-ish years. There were so many interesting and useful responses. One person drew a crew of happy inner-tubers (beer implied), and someone at a different table drew one big inner tube. Most had more than one method of getting across. Others had thought about setting up villages or resorts on one side or the other to show the community that would be important, or close communication, or the bringing together of units that are currently separate. The creativity and thoughtfulness in the room was so inspiring! At the end we asked participants what one thing they wanted to take back or change first at their institutions. My own answer was that I want to hand out blank maps to the people I work with on campus and see what we each think the current model looks like, and where we each hope it might go.